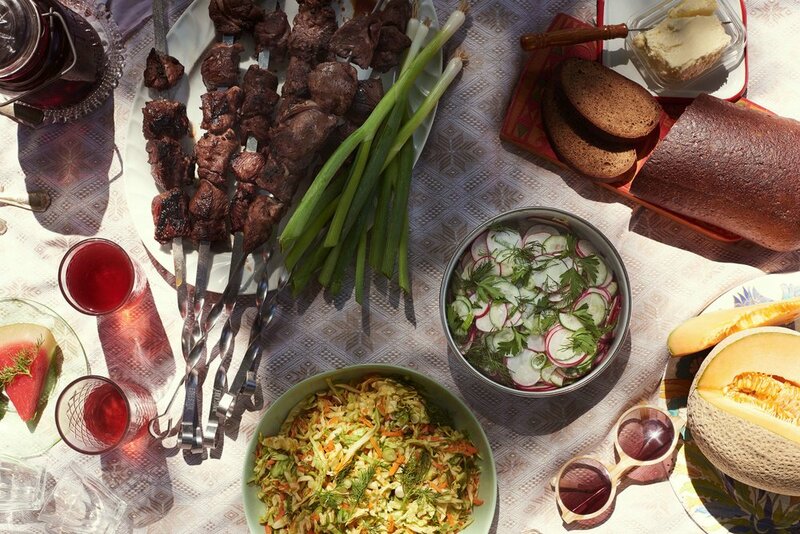 Editor’s note: Early this summer we spent an afternoon in Brooklyn’s Prospect Park with Sasha Shor enjoying an elaborate Russian picnic spread made up of recipes her family brought with them from the Soviet Union to Nashville in the late 1970s. Sasha is the type of cook that’s so passionate about food she arrived with surprises to be revealed throughout the afternoon: cured meats from a Russian grocer, vodka infused with lemon peel and horseradish that she made herself so we could raise a glass, and a cookbook from the Soviet Union to peruse. Starting today, and in the coming weeks, we will share Sasha’s story along with 8 recipes from her kitchen. In the long months of Tennessee’s hot summers, Sasha Shor’s family would pile into their family car and drive the few hours to the Smoky Mountains. “We did not have money to go on vacations,” she explains, “camping was pretty much the only vacations we took.” Their campsite at the base of a mountain or by a lake was always filled with jars of homemade pickles and deep purple borscht, vegetables ready to be turned into salads, and a cooler full of lamb marinating in red wine, coriander, and pomegranate molasses, ready to be skewered and grilled. Sasha around age 7 with her Grandmother at a dacha right before they came to America. 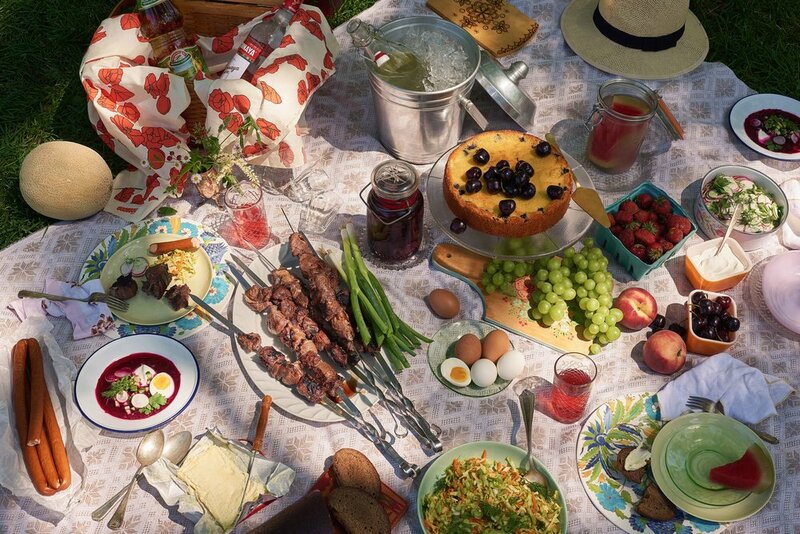 The picnics were nearly identical to the meals at her grandparents’ dacha, or summer cottage in the Carpathian Mountains, a few hours from where Sasha was born in Kishinev, in what was then the USSR and today is Moldova. The dachas “were like family summer camps...much like the Catskills,” she explains. “It was very rustic, very rural. There was nothing fancy going on — everyone slept in cots.” But, the meals were feasts. A lamb was fattened up during a week-long visit and then roasted on a spit on the last evening and families set out early in the mornings to forage for wild chanterelle mushrooms that were sauteed in butter and sour cream and served for breakfast. When Sasha was 7-years-old, her family gained a visa to leave the Soviet Union and set out for Nashville, where relatives who came through Ellis Island in the 1930s had settled. “We came with literally nothing,” Sasha recalls. A crate per family, which Sasha’s mother packed with family linens and kitchen items, was allowed, but it took almost a year for it to reach them. Each family member was allowed just two pieces of luggage when they left. Sasha’s mother Marina filled one of hers with an elaborate collection of menus she had kept from restaurants she loved and special occasions. The bag was confiscated when a Soviet official claimed the menus were property of the government. “She was heartbroken, half a lifetime of collecting food memories,” were lost, Sasha recalls. Even when she was young, Sasha was part of the kitchen brigade. “When you're little in a Russian kitchen you work up the ranks. When you’re young you peel carrots and potatoes until you’re blue in the face,” she jokes. She learned to make stuffed peppers, stewed chicken with onions, and “whatever my mom decided needed to be made,” by the time she was 10. Until her family left Europe, Sasha continues: “the Jewish foods we prepared [were] really our only connection to Judaism — even unknowingly.” That started to shift in Nashville, where she attended a Yeshiva for grade school. After learning about kashrut, Sasha came home from school and saw her mother making stroganoff (beef with sour cream and mushrooms). “I was like: ‘Gahh! What are you doing?’” Sasha recalls. Russian cooking sustained Sasha through high school, but when she moved to New York City to attend art school, she started to explore other cuisines with an insatiable appetite. “I had no idea about all these ethnicities and culinary traditions, I became obsessed,” she says. She would take the long train ride to Flushing in Queens for Chinese food, head to 32nd street to explore Manhattan’s Koreatown, and set out for the Russian enclave of Brooklyn’s Brighton Beach when she was homesick. After a career in advertising during which she hosted elaborate dinner parties, Sasha had the opportunity to open a chain of restaurants in New York called Tres Carnes that blended Mexican cooking with barbecue. She found her way back to the Russian kitchen, to borscht, dacha spreads, pickles, skewers of lamb, and fresh salads, when her children were little. “It was something I wanted to do for them,” she says. And, a mashup in the form of a borscht burrito with smoked brisket, beet pico de gallo, dill, and sour cream at Tres Carnes “was the beginning of me starting to fall back in love with Russian food and realizing how connected to it I was,” she says. In Sasha’s family home there was a dedicated cooler for shashliki, or Georgian-style lamb kabobs. As her family drove to the mountains, the meat swam in a marinade of garlic, onion, red wine, pomegranate molasses, dried coriander, and oregano. When they arrived at the campsite, “everyone had their cooking jobs,” Sasha explains. Grilling was her father’s domain, but Sasha would designate herself his number two, skewering the meat, helping rotate the skewers, and of course taste testing. 1. In a large bowl, combine the red wine, red wine vinegar, pomegranate molasses, olive oil, salt, sugar, black pepper, coriander, oregano, garlic cloves, and onion. Place the lamb cubes in a non-reactive container or large ziplock bag and cover with the marinade. Refrigerate and allow to marinate for at least 6 hours, but no longer than 14 hours. 2. Remove meat from the marinade, discarding all solids. Thread the meat cubes onto heavy, flat metal skewers (6-8 cubes per skewer) and season with salt and pepper. 3. Grill over medium-high heat for 7-8 minutes per side rotating them as needed until cooked through and evenly charred on all sides. 4. Serve immediately with sliced raw onion and pomegranate molasses and adjika (Georgian pepper paste) for dipping. No Russian meal is complete without salads. During the summers in Nashville, salads were made with the vegetables her mother and grandfather grew in their backyards. Before heading to the mountain, whole vegetables were always picked and packed, so the salads could be made just before eating. 1. Place the cabbage in a large bowl and sprinkle with the kosher salt. Massage salt evenly into the cabbage with your hands until it starts to soften. Let sit for 5-10 minutes. 2. To the cabbage, add the grated carrot, scallions and dill. Mix to combine. 3. Dress with sunflower oil, vinegar, and pepper and mix until evenly combined. Taste for salt and acidity and adjust if necessary. 4. Refrigerate for 15-30 minutes before serving to let all the flavors come together and for the cabbage to soften a bit more. Garnish with fresh dill right before serving. 1. In a small bowl, combine the sour cream, mayonnaise, white vinegar, salt and pepper. Set aside. 2. In a large bowl, combine radishes, cucumbers, scallions, dill, and parsley. Mix well. 3. Add dressing and mix to incorporate right before serving. Garnish with thinly sliced scallion. Chef's Note: Adding the dressing too far in advance will cause the juices in the cucumber and radish to run and make the salad too watery. While Sasha’s father attended to the meat, her grandfather, dedushka Isay, put himself in charge of the family’s pickle supply. There was a never ending parade of pickled goods throughout the year in Sasha’s family refrigerator. But, the summer brought her grandfather’s favorite: watermelon. “He always had a few 2-gallon jars full of ruby red, glistening, watermelon hunks fermenting and ready to eat with every meal. It was on every summer table and every picnic. Ice cold, briny, tangy and garlicky,” she wrote to us. While Russian pickles are readily available at Eastern European groceries, this simple recipe is worth pursuing. The result is balanced fruit pickle that’s both sweet and savory, a perfect compliment to grilled meats. Recipe is based on a 6 quart non-reactive container or crock. Do not use a metal container. 1. Make the brine: In a large saucepan, heat 2 cups of water until simmering. Remove from heat and stir in kosher salt until fully dissolved. Let cool completely. Add remaining 10 cups water and stir to combine. 2. Slice and cut watermelon into small triangles or chunks, with rind and outer skin still attached. Pieces should be about 1½ inches thick. 3. In a wide mouth crock or container, layer watermelon with garlic, peppercorns, celery and dill to the top of the container, leaving about an inch at the top. Fill the container with the saltwater brine to cover the watermelon. Place a small plate that fits inside the container on top of the watermelon to keep it submerged. 4. Cover the container with a double layer of cheesecloth and secure with a rubber band around the outer rim of the container. This will allow it to breathe but keep out any dust or dirt. Place container somewhere dark, undisturbed and not too cold - a clean unused corner of a closet or a cabinet under a sink. After 24 hours, the lacto-fermentation will start to take effect. Taste after 2-3 days. The watermelon should have a nice sweet-sour tang. 5. If you like it as is, transfer to glass jars and place in the fridge to slow the fermentation. If you prefer a tangier, more fermented flavor, leave for another 12-24 hours, then transfer to a jar in the fridge. The watermelon will continue to ferment slowly. Always keep it in the fridge and serve it ice cold. It will last for up to 1 month in the fridge. Chefs tip: Do not discard the brine! It’s amazing in dirty martinis, vinaigrettes, icy vodka chasers, and just plain, in a small glass as a very effective hangover tonic!